Tasmanian Government announces provision of care extended from age 18 to 21. Home Stretch calls on other states to follow Tasmania’s lead. Home Stretch Chair Paul McDonald has welcomed the Tasmanian Government’s announcement to extend out-of-home care to 21. Tasmania’s Human Services Minister Jacquie Petrusma announced the news on Wednesday when announcing the Liberals’ child safety policy. The policy announced by the Liberal party also included incentive payments of $2500 to be paid to both the foster carer and the young person when they successfully complete Year 12. A $16.7 million package was announced, which includes funding to extend the out-of-home care system, allowing young people to remain in care until the age of 21. Mr McDonald praised the announcement and said the decision is the most significant announcement by any State Government for children in care in a generation. “It is now time for all other Australian states and territories to follow Tasmania’s lead and support young people in care by extending the age of care to 21,” he said. 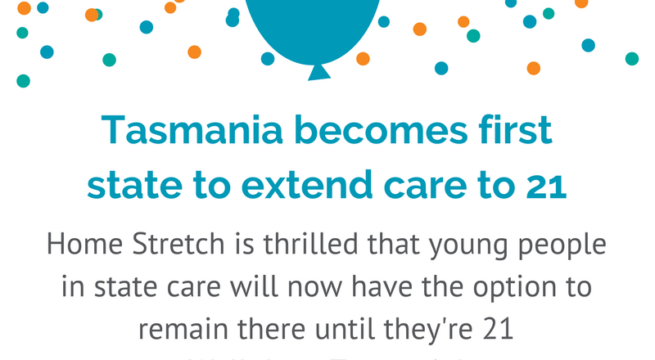 Leading up to the 3rd March election, this guarantees extended care to 21 years for care leavers in Tasmania, with Tasmanian Labor making a similar announcement last month. The Victorian Home Stretch campaign is generously funded by Gandel Philanthropy, David Taylor Galt Charitable Trust managed by Equity Trustees, The William Buckland Foundation, & Sidney Myer Fund.